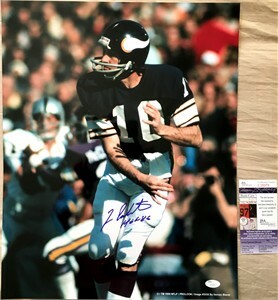 16x20 inch poster size photo autographed in blue Sharpie by legendary Minnesota Vikings Hall of Fame quarterback Fran Tarkenton and inscribed HOF 86. Authenticated by JSA with their matching numbered sticker on the photo and certificate of authenticity card. ONLY ONE AVAILABLE FOR SALE.